Thank you to the yoga4all community for the magnificent attendance at our 20th Anniversary Open House! We raised over $1000 and have a truck-load of donations for Pet Pal Animal Shelter!! We are truly humbled by your generosity, your kindness and your support. 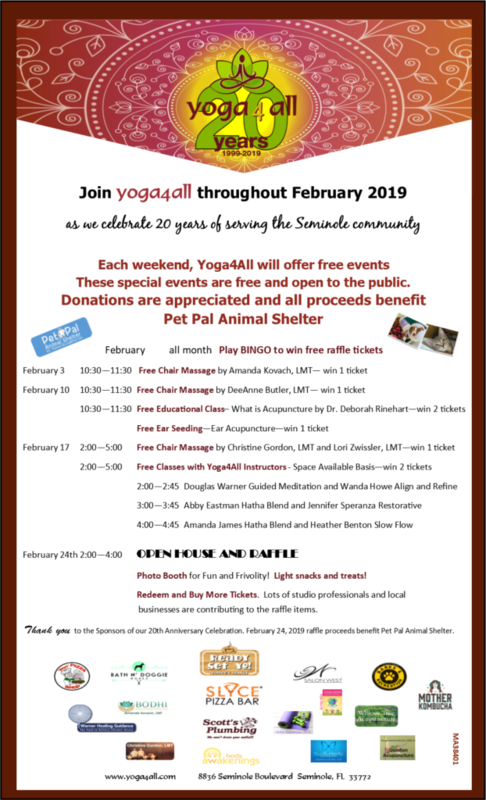 Join Yoga 4 All for the entire month of February 2019, in celebrating their 20 years of serving the community offering Yoga, Massage, Meditation, Personalized Training and Acupuncture. There will be special events at the studio each weekend in the month of February with donations during the month dedicated to Pet Pal Animal Shelter in St. Pete. We will have lots of fun activities, events, games and other ways to win tickets to use in the Raffle on February 24th!! On February 2, 10 and 17, the massage therapists will offer chair massages by donation and you can get discount coupons for future massages. See above flyer for schedule. On February 10, from 10:30 – 11:30 am, there will be a free talk, “What is Acupuncture?” given by Dr. Deb Rinehart at the studio. Watch for other opportunities to learn more about acupuncture and receive free ear seeding! 45-minute yoga classes will also be offered for free (donations to Pet Pal Animal Shelter graciously accepted) February 17 at 2:00, 3:00 and 4:00 pm. The month-long celebration culminates in an Open House on February 24th at Yoga 4 All studios from 2:00 to 4:00 pm. There will be hors d’oeuvres, refreshments and a Snapshoot photo booth for fun!! Donations to the raffle include Massage, Acupuncture, a Tarot card reading, private Yoga Sessions, yoga props like blocks, eggs, straps and a Jade yoga mat. Ready Set Yo! will be there with juice and other goodies and Slyce will offer some tasty morsels as well. Gift cards donated to the raffle include Slyce and “Your” Pizza Shop, Mother Kombucha, Salon West, Barks & Recreation, Bath N’ Doggie Works, Publix from Scott’s Plumbing and other unique gift baskets. You can win tickets for playing YOGA BINGO or by attending our special events. Tickets are available for purchase at 3 for $5 or 8 for $10!